Doritos have announced that their products will no longer be limited to chips and dips. Its newest offering is baked Doritos Crackers, in four flavours offering a mouthful of flavour and crunch. The available flavours include: Cheese Supreme, Mexicana, Texan BBQ and Sweet Chilli and Sour Cream. According to Pedestrian.TV, the original Cheese Supreme Dorito corn chips are the number one selling flavour in Australia so these new Crackers are sure to make waves within the market. Doritos Brand Manager Alison Silver said: “Doritos Crackers are an exciting way to attract a new consumer base to the biscuit category in the form of millennials, who are the heartland of Doritos. The brand has a cult following with the young and hungry and we are thrilled to be able to deliver them with an exciting new way to enjoy iconic Doritos flavours”. 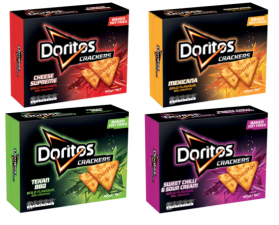 The Dorito Crackers are a world first for the brand, and Australians will be the first ones to get them. The range will be stocked nationally in grocery as well as petrol and convenience, from mid-April 2018.